The long planned Highland Park Way SW and SW Holden roundabout is apparently on hold again awaiting potential funding from the state. 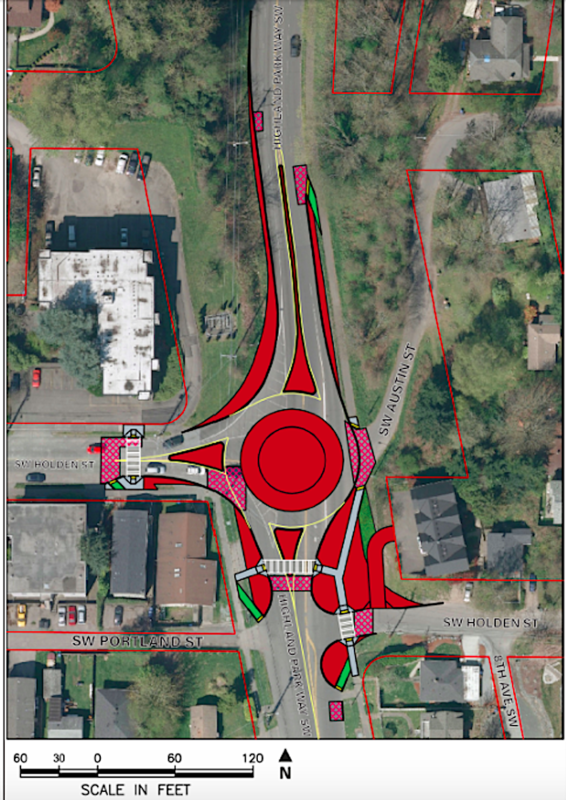 During last year’s budget, I was able to get the Highland Park Way SW/SW Holden Street Roundabout project added to the SDOT Capital Improvement Program, the long-term capital planning budget. Unfortunately, we learned in January the grant application SDOT submitted to WSDOT was unsuccessful. Since then I’ve worked with state legislators to seek funding through the state legislative process. Senator Joe Nguyen and Representative Joe Fitzgibbon have submitted this as a potential project in the state transportation budget. Funds are limited in the state transportation budget, but I want to give a big thank you to both Senator Nguyen and Representative Fitzgibbon for putting forward applications to their respective Transportation Chairs! The Chairs of the Senate Transportation Committee and the House Transportation Committee will release their proposed budgets in the next few weeks.